Composite Hose has found its place in the heart of both shipping and storage industries fluid transfer processes. Its key benefit over alternative hoses and loading arms is that it is lightweight, highly flexible and can be used for multiple purposes. Being manufactured from multi-layers of thermoplastics and an inner and outer wire helix, the hose has a long shelf life and high safety factor. However, it still can be damaged. The majority of end users see the benefits of composite hoses outweighing the negatives, and its worldwide usage is at an all-time high. Dantec Limited, the world leader in composite technology, always strive to put safety at the forefront of their products. To ensure safe practice and to add longevity to the hoses Dantec supply; a hose handling guide encompassing storage, testing and inspection guidelines is included with every one of their large bore hoses. Through market research and working closely with their end-user customers and quality assurance departments, Dantec has found that 70% of composite hose failures are due to a lack of support at the critical termination point. Causing over-flexing and bending of the hose in the transition area between the relatively soft, pliable hose wall and the hard end connection area. Dantec is fully focused on developing a cost-effective solution to increase the longevity of composite hoses for its users. 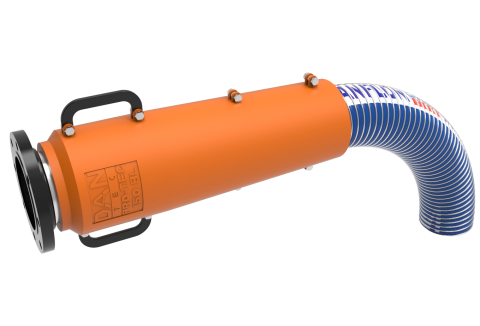 With this in mind, Dantec has designed and developed the first ever Composite Hose Bend Limiter Dan Pro~Tec BL. This innovative product fixes to the outside of the composite hose on the first string at the Tank or shipside adding support to the hose, eliminating the overflexing and bending concern. The BL removes the strain from the fixed transition area and allows the hose to bend naturally further down the hose. The BL made from polyurethane, flexes with the hose while taking the strain and relaxes again once the hose is relaxed. There is no requirement for it to be permanently fixed on one hose so once purchased it can be easily moved about and remounted on whichever hose is in use. Having trialled the product in 2 major UK storage companies and performed extensive extreme over-flexing, bending and even half-ton strain tests on the product. Dantec have proved the concept works and have produced the BL ready to improve the life of composite hose in the market.